The measures came early on Saturday after the Catalan parliament voted to declare independence on Friday. 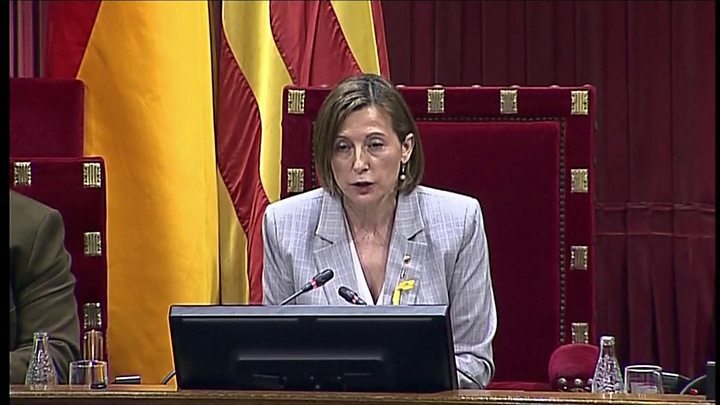 An official state bulletin dismissed Catalan leaders and handed control of Catalonia to Spain's Deputy Prime Minister, Soraya Saenz de Santamaria. Catalan leader Carles Puigdemont has called for "democratic opposition" to the takeover. He made the call in a TV address broadcast from an undisclosed location. Earlier, Spain's interior ministry took charge of Catalonia's police after firing senior Catalan police officials. On Friday, PM Mariano Rajoy announced the dissolution of the regional parliament and the removal of the Catalan leader, and called snap local elections. Demonstrations for and against independence went on into the night. A large rally "for the unity of Spain and the constitution" is being held in Madrid. The crisis began when Catalan leaders held an independence referendum, defying a ruling by the Constitutional Court which had declared it illegal. The Catalan government said that of the 43% of potential voters who took part, 90% were in favour of independence. Others boycotted the vote after the court ruling. Media captionAt times there were tensions between opposing sets of demonstrators. On Friday afternoon, the Catalan regional parliament voted to declare independence from Spain. Soon after, the Spanish Senate granted Mr Rajoy's government the power to impose direct rule on Catalonia. It did so early on Saturday by publishing an official bulletin (in Spanish) that dismissed Mr Puigdemont and all government members. The announcement came hours after the Madrid government removed Josep Lluís Trapero Álvarez as chief of Catalonia's autonomous Mossos police force. Mr Trapero was already under investigation for sedition, accused of failing to help Spain's Guardia Civil police tackle thousands of pro-independence protesters in Barcelona during the run-up to the referendum. He was replaced by Ferran López, his deputy. Pere Soler i Campins, director general of the Mossos, was also dismissed. The BBC's Sarah Rainsford, in Madrid, said that implementing the changes is likely to be a complex process for Spanish authorities - and one bound to be met with stiff resistance from those who just voted for independence. Mr Puigdemont has urged supporters to "maintain the momentum" in a peaceful manner, but Spanish prosecutors say they will file charges of "rebellion" against him next week. But the Spanish Constitutional Court is likely to declare it illegal, while the EU, the US, the UK, Germany and France all expressed support for Spanish unity. What powers did Catalonia have? 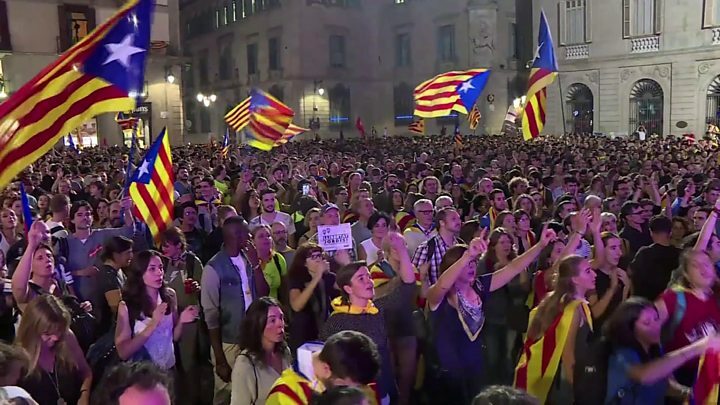 Thousands celebrated the declaration of independence on the streets of Barcelona, Catalonia's regional capital. There were pro-unity demonstrations too, with protesters in Barcelona waving Spanish flags and denouncing Catalan independence. A large pro-unity rally is expected in Madrid on Saturday. Barcelona's mayor Ada Colau condemned the move by Madrid, but also criticised Catalan pro-independence parties for "advancing at a kamikaze pace...after their mistaken reading of the results of the Catalan elections"
The UK government said it did not recognise the declaration of independence by Catalonia. He ignored warnings by the Madrid government to cancel the move, prompting Mr Rajoy to first announce his plans to remove Catalan leaders and impose direct rule. Catalonia is one of Spain's richest, most distinctive regions, with a high degree of autonomy. Many Catalans feel they pay more to Madrid than they get back, and there are historical grievances, too, in particular Catalonia's treatment under the dictatorship of General Franco. But Catalans have been divided on the question of independence.